SEOUL, Sept. 13 (Yonhap) — Justin Thomas, world No. 4 in men’s golf, will travel to South Korea next month to defend his PGA Tour title here, the event’s organizers said Thursday. CJ Group, the host of the CJ Cup@Nine Bridge, announced that Thomas was the first non-Korean player to commit to the Oct. 18-21 tournament. 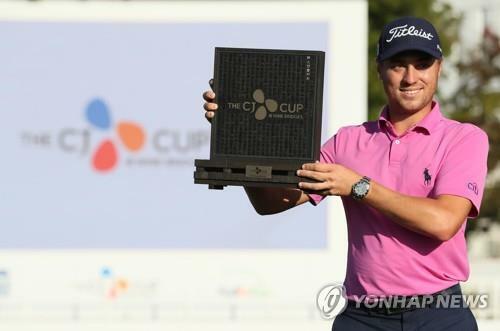 Thomas defeated Marc Leishman in a playoff to win the inaugural CJ Cup in 2017 at the Club at Nine Bridges on the southern resort island of Jeju. This year’s tournament will be back at the same venue. That victory last October was Thomas’ first of three wins in the 2017-2018 season. The 2017 PGA Tour Player of the Year reached the top of the world rankings in May this year but has since slipped to No. 4. He hasn’t fallen out of the top five since September 2017.